Fajitas are often on the menu in our house. Not only are they delicious, simple and fast to cook, they make food fun for the kids which generally encourages them to eat more vegetables! We love adding peppers, salad, cheese, mayo and onion to ours and when the Mini Mes can construct them themselves they enjoy meal time even more. It's an ideal family food. 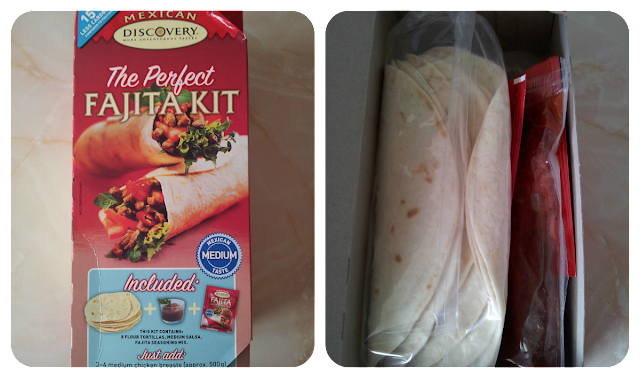 We were sent a Fajita Kit to review from Discovery and the first thing I noticed was the size of the packaging. Alternative branded kits usually come in huge boxes which can be hard to store away in the cupboards but the Discovery packet is considerably smaller due to the tortillas being rolled. I think this is a great idea! The kit contains 8 plain flour tortillas, a seasoning sachet and medium salsa. It should easily feed a family of four and is suitable for both vegetarians and vegans. If there are more hungry tums that need filling you can buy extra tortillas seperately or you could maybe make a salad or some wedges to go with them. The instructions are simple to follow and you only need your meat/quorn, peppers and onions to to go with the kit. Cooking time is approximately 10 minutes with the veg and turkey (in our case) going into the pan to cook through and the tortillas being warmed through in the microwave for a few seconds. The mexican aroma was amazing! The tortillas were a good thickness and we were able to fold them with ease around the filling without any tears. The salsa was full of flavour with a kick but without being overpowering and the seasoning was also very tasty. There were empty plates all round. We love Discovery foods especially the kits! Great for Summer and so quick! Just messy to clean up! Discovery are great! We love the chilli sauce with powder on the top. Makes an amazing chilli con carne!